For many, virtual reality conjures extreme video gaming or fantastical journeys into other dimensions from the comfort of your couch. But immersive, 3D experiences are now being used to prepare doctors for surgery, design airplanes, and engage Americans on climate impacts. This week, Climate Access launched the Look Ahead - San Francisco campaign in partnership with the City of San Francisco. The campaign is centered around the Look Ahead virtual reality app, which offers a first-person look at future sea-level rise in three locations in San Francisco – the Embarcadero, Mission Creek and Heron’s Head Park – and how these sites could benefit from climate solutions. Available for download onto smartphones and tablets the Look Ahead app downloads provides a 360-degree tour that includes key landmarks, infrastructure and recreation points being used by virtual people. The view of some of San Francisco’s iconic landscapes submerged under water is arresting. But the Look Ahead app isn’t just about visualizing risk. The interface also shows a range of potential responses and makes it easy for users to sign up for more information, take steps to reduce risks from flooding and help cut carbon emissions. Climate leaders who are unfamiliar with the potential of VR should see it for themselves. (Download the Look Ahead app via Google Play or the Apple App Store.) Last year I visited Stanford University where they are studying the effect of virtual reality on public perceptions and behaviors. Their research shows that VR can increase environmental concern and motivation and promote altruism. On the other hand, violent VR experiences can lead to more aggressive behavior. That’s why it’s important to understand what’s emerging and how VR can be used to promote social good as well as avoid harm. 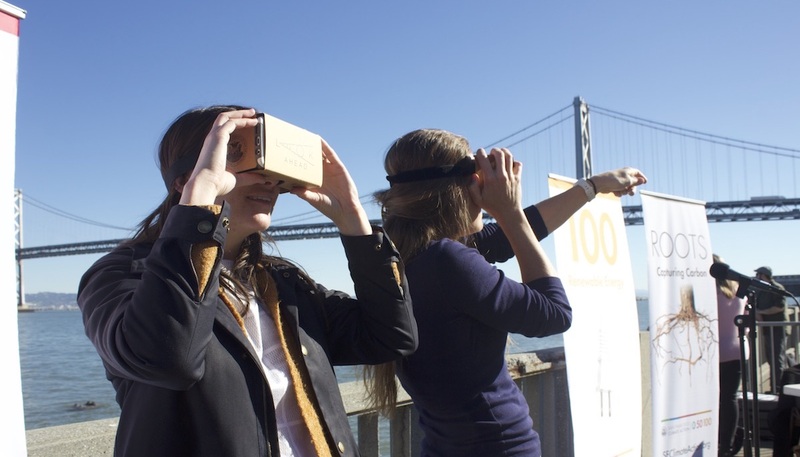 Look Ahead – San Francisco builds on earlier efforts to test the use of virtual reality in climate communication. We led projects in Marin and San Mateo County, where VR viewers were installed near locations at risk from sea-level rise. With the help of Dr. Susanne Moser and Christa Daniels of Antioch University, we found that VR can increase concern around climate impacts like sea-level rise and the will to act. Thousands of communities members checked out the viewers and shared their concerns and support for action via the VR platform – information that county officials used to shape local resilience plans. Virtual reality is soon to become mainstream and potentially as disruptive as the introduction of the internet and social media. The day after the launch of Look Ahead, the sale of VR headsets hit a new high of one million sold just over the last quarter. Are you ready for the new reality of virtual reality?